In 1729, Jonathan Swift wrote A Modest Proposal. This classic satire, which proposed solving the problem of Irish poverty by eating the children, has been a staple of English literature for centuries. 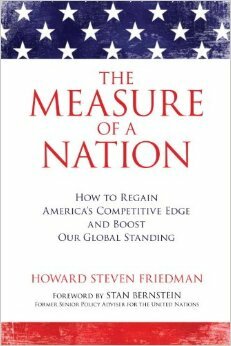 Howard Steven Friedman brings this classic into the 21st century through America’s current concerns about the economy, sustainability of social programs, the environment, class warfare, and inequality. This new Modest Proposal offers an equally shocking satirical solution before unpacking the data to explain the real causes of America’s current financial struggle and presenting the practical solutions that Washington is currently avoiding. Today’s increased polarization in government has led to all-time lows in approval ratings with neither extreme able to develop plans that reflect reality. Ultra-conservatives seek to pare down the government to post-Revolutionary War levels while ultra-liberals are convinced that there is no limit to our ability to issue debt and borrow without consequences. Neither of these groups lives in the real world of data. Most of us find ourselves in between these two extreme views, yet partisan spin is preventing a serious discussion of what the federal budget data really show and the steps needed to put America back on the path of success. 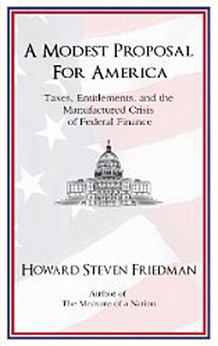 A Modest Proposal for America: Taxes, Entitlements, and the Manufactured Crisis of Federal Finance taps into Friedman’s real world data analysis experience to create viable solutions for the America we live in today and will live in for decades to come.